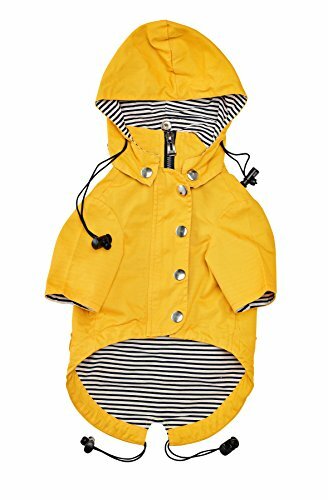 Ellie Dog Wear presents the Rainy Day Raincoat! Whether you want to keep your dog dry during monsoon season or you'd like to give Fido something stylish to wear then your trendy with our signature Rainy Day Raincoat. COMFORT & DESIGN Our design specialist took the very best of todays stylish outerwear and designed them to fit comfortably on your dog so they can stay warm and look their best at all times. Our products were designed to protect your dog from the elements. Water resistant, snow friendly, and insulted enough to keep even the short haired dogs happy in the cold For the most accurate sizing for your dog, please be sure to measure your dog and compare it with our sizing chart below. Size: - XS: 10" neck, 13.5" chest. 8.25" back - S: 11" neck, 17" chest. 10.5" back - M: 13" neck, 20" chest. 15" back - L: 16" neck, 27.5" chest. 20" back - XL: 17.5" neck, 34" chest. 22" back ADJUSTABILITY We have your dogs comfort in mind. Each product is fully adjustable to fit your dogs needs and is perfectly insulated to keep them warm even in the roughest climates. BUTTONED POCKETS Each pocket has a durable button that allows your dog to keep small objects with them while you are out. Keep your treats, small toys, or even your keys with them! REMOVABLE HOODIE We give you the option to keep the hoodie on or off with our removable button on hoodie. QUALITY TESTING Each one of our products are quality tested by a reputable third party for quality testing to maintain the best knitting and crafting without compromise on material and quality. ✔️ DOUBLE LAYERED DESIGN - Double layered zip up raincoat with additional buttons makes putting this coat on easy as well as adjustable and stylish. ✔️ WATER RESISTANT - Completely water resistant and will keep your dog safe and dry in all weather conditions. ✔️ MULTIPLE POCKET DESIGN - Our dog raincoats comes with multiple buttoned pockets for easy storage of small items and also includes a removable hoodie. ✔️ QUALITY INSPECTED - Are you worried about ordering products from China? Our products have been inspected by a reputable third party for quality assurance. No compromise on material and quality. If you have any questions about this product by Ellie Dog Wear, contact us by completing and submitting the form below. If you are looking for a specif part number, please include it with your message.